"... A myth contains some sort of truth, no matter how obscure, about the challenges and meanings of life." arc from the publishers (and a beautiful finished copy as well) - my sincere thanks. I wish I had the time to go back and read this book again because one time through just isn't enough. There's so much here, beginning with a suicide foretold and the revelation that the main (unnamed) character's grandfather was killed quite possibly by an entire village who then may have proceeded to cover up the incident. Aha! I said to myself, a mystery story -- right up my alley. But I was wrong. While there is an element of mystery in Blood-Drenched Beard, it's really the frame for a story that examines connections through the eyes of the main character, someone who suffers from a strange affliction called prosopagnosia, a condition in which a person cannot recognize faces. Set in Brazil, it is during a visit to his father that the unnamed young man learns two things. The first bit of news he receives is that his short-fused grandfather died in a small fishing village called Garopaba. The revelation is a bit of a shock, as his father had repeatedly told him he had no idea how or where he'd died. As it turns out, the grandfather had only been there for two years before "they killed him." The young man's father never saw the body, only an "awful stone with no name on it," leaving him "never really convinced." The second shock he receives is his father's announcement that he's planning on killing himself the next day and that he wants his son to take care of his dog. It isn't long afterward that the young man, along with the dog, is looking for a place to live in Garopaba, where he hopes to find out what really happened to his grandfather. There he discovers that memories run deep -- and finds himself an unwelcome visitor when he starts asking questions. But during what starts out as a quest, so to speak, to discover the truth, he ends up finding out more than he'd bargained for, mainly about himself. If the mystery behind the grandfather's death was the sum total of this novel, it would still be good, but Galera launches out into territory well beyond the expected. One of the biggest ideas that runs throughout this entire book is the connection between people around whom stories/myths are created and the basis of these legends that are found in the reality and ordinary challenges of living. This is especially true in this little seaside village, where memories of the past tend to loom larger than life for those who've been there most of their lives. But memory can have its limitations, another idea found in this novel. The bulk of Blood-Drenched Beard is composed of events in the daily life of the unnamed main character. Aside from the problems inherent in living with his condition, he also has family issues dogging him, complications with the women in his life, and then there's how he's perceived by the locals in Garopaba. One of the things I enjoyed most about this book is that since he has problems recognizing faces, he can only remember people through clues like the way someone wears his or her hair, or gestures they make, ways of speaking, etc., all described to the reader so that eventually what starts to come across is a feel for the small details that separate human beings from each other. While there are also moments where things sort of slow down and just plain lag, the story is beyond excellent, and there's some quality of the author's style that I can't really explain that impressed me. I was not in a hurry to get to the ending just because I was sort of loving the way he writes. I know that sounds kind of stupid, and if I saw that sentence in a professional/critical review, I'd probably roll my eyes, but in my case, it's true. There's just something in his imagery that appeals. 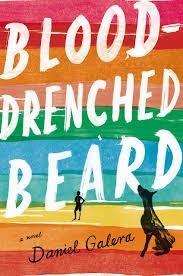 Blood-Drenched Beard is not one of those books that everyone's going to fall in love with, and that's okay. I am one of those people who reads to appreciate what's inside someone's head, and this book does that and does it very well. Frankly, I was downright impressed with this author's talent and if his other novels are anywhere close to this good, someone should be translating more of his works. I can't thank Brooke at Penguin enough for asking me if I might be interested in reading this book. Just one more thing. Early on in the novel the main character's father advises him to read Borges' short story "The South," and after finishing this novel, I did just that. I advise anyone who is a Borges fan to do the same.